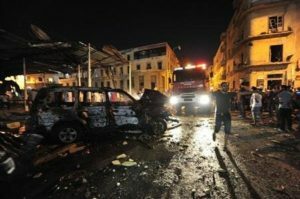 WASHINGTON — Violence has erupted throughout Libya as an Islamist party office was attacked in the capital city of Tripoli. Reuters reports that the Libyan city of Benghazi, made infamous by the September 11th, 2012 attacks that killed U.S. Ambassador Christopher Stevens, was also a center of violence. Current Libyan Prime Minister Ali Zeidan has promised a reshuffling of his cabinet to stabilize the increasingly violent and turbulent situation in Libya and the most recent casualty was Social Affairs Minister Kamila Khamis al-Mazini. The country’s newest army chief of staff was selected by the Libyan national assembly, Abdesalam Jadallah, a colonel in the special forces. He is expected to strengthen the Libyan military and try to gain control of the rising chaos. Jadallah was a former rebel commander during the upheaval and civil war that toppled the longtime dictatorial regime led by Muamar Qaddafi. His predecessor resigned after the Benghazi attacks last September on the U.S. consulate. Apparently the reason behind the violence was the killing of Abdelsalam al-Mosmary, who was an outspoken critic of the Islamist Muslim Brotherhood movement in Egypt. He was gunned down as he departed a mosque in Benghazi last Friday. His death marks another killing by Muslim Brotherhood supporters throughout the Middle East, with two secular lawmakers gunned down in Tunisia within the past year.